Fascination with the end times is not just a recent phenomenon. The young church at Thessalonica, having taken root during Paul's brief stay there, pondered when the end might come as well. Paul, in order to instruct them more fully, wrote them two letters, which taken together expound the "already-and-not-yet" character of the end times. His instruction and counsel can serve us well today. Throughout this commentary, G K Beale explains what each letter meant to its original hearers and its application for us today. 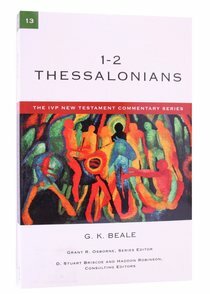 About "Ivp Ntc: 1-2 Thessalonians (Ivp New Testament Commentary Series)"
G. K. Beale (Ph.D., University of Cambridge) is Visiting Professor of New Testament at Westminster Theological Seminary, PA- while holding the position of Kenneth T. Wessner Professor of New Testament at Wheaton College Graduate School in Wheaton, Illinois. His books include The Book of Revelation (New International Greek Testament Commentary), 1-2 Thessalonians (The IVP New Testament Commentary Series), The Right Doctrine from the Wrong Texts? Essays on the Use of the Old Testament in the New, John's Use of the Old Testament in Revelation and The Temple and the Church's Mission: A Biblical Theology of the Dwelling Place of God. He is also a contributor to the New Dictionary of Biblical Theology and his most recent works are We Become What We Worship: A Biblical Theology of Idolatry, Colossians, Philemon (Baker Exegetical Commentary of the New Testament) and The Pastorals (Zondervan Exegetical Commentary). First-century Corinth and its challenges were not so different from our own. Upwardly mobile Christians facing radically diverse ethnic, religious, economic and social conditions. The church divided over issues of leadership and authority, sexual morality, gender and worship, marriage and divorce. Sound familiar? Yet as Alan Johnson highlights in this excellent commentary, in the midst of this detailed, practical letter to a church in crisis Paul has penned one of the greatest paeans to love ever written. And, of course, love is just what is needed to address complex human issues--whether in the first century or the twenty-first. Johnson's deft analysis of 1 Corinthians features an introduction that explores the social, cultural and historical background of the city and its people. Rounding out the introduction, Johnson discusses the letter's occasion and date, authorship and purpose, and major theologicall themes. His passage-by-passage commentary follows, seeking to explain what the letter of 1 Corinthians means for the church today as well as what it meant for its original hearers. Use this resources in your own studies of 1 Corinthians, and you may be surprised how relevant it is to the issues you face today as well. Questions about the nature of Christian leadership and authority, attitudes toward wealth and materialism, proper responses to cults, the role of women in the church, and even the validity of the institution of marriage are not new. Paul addressed these issues in personal letters to Timothy and Titus as leaders of first-century congregations in Ephesus and Crete. What he had to say to them is as relevant to us as today's newspaper headlines. In this clear, pastorally oriented commentary, readers will find helpful background material on authorship, date and purpose, as well as an overview of theological themes in the Pastoral Epistles. The introductory material is followed by passage-by-passage explanation of the meaning these letters had for their first-century hearers in order to pave the way for understanding their significance for readers today. Students, pastors, Bible teachers and everyone who wants to understand the message of the Pastoral Epistles for the church will benefit from this excellent resource. When to fight and when to compromise are not always easy choices to make. Stubbornly defending the truth can easily end up in arrogance that discredits the gospel, while too readily seeking middle ground can leave truth by the wayside. Torn by conflict and marred by schism, the congregation to whom John addressed his letters stood in need of his strong exhortations to love and unity within the bounds of truth. His word to them is well suited to the church today, confronted by controversies within and without that challenge its ability and will to stand for the truth in a pluralistic society. In this careful study of John's letters, readers will find an introduction, that discusses the letters' occasion and purpose, authorship and date, orders and theological themes. A passage-by-passage commentary follows that seeks to explain what each letter means for us today as well as what it meant for its original hearers.